Dr. Cech attended Fairfield University in Connecticut and Boston University School of Dental Medicine. Following dental school, she completed a General Practice Residency at Long Island College Hospital in Brooklyn, NY. Having finished her "formal" education, she then practiced dentistry in a non-profit clinic in lower Manhattan for 5 years. The unique make-up of this clinic allowed Dr. Cech to perform general dentistry side-by-side with numerous specialists, bringing patient's dental needs to completion in one location. During this time, Dr. Cech was also associated with a private practice, allowing her to experience the business of dentistry as well as performing dentistry for a truly diverse clientele. Dr. Cech opened her own practice in Manchester, Vermont in 1995 and has watched it evolve into a comprehensive general practice with wonderful patients. She is a member of the American Dental Association, Academy of General Dentistry, Vermont State Dental Association and the Arizona State Dental Association. She has attended the Pankey Institute for Continuing Education and The Spear Institute in Seattle; she is also a member of the Faculty Club at the Scottsdale Institute for Advanced Dental Education. 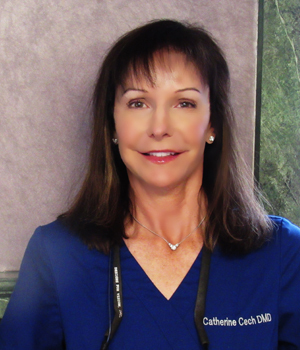 Dr. Cech embraced the CAD/CAM technology of CEREC and is now a Mentor with CEREC doctors. She actively continues her education by attending conventions and lectures throughout the US. Most recently, Dr. Cech completed her fellowship with the International Dental Implant Association and doing mission work for patients in the Dominican Republic. In creating balance in her life, Dr. Cech takes physical exercise seriously by practicing yoga, cycling, showjumping horses and playing polo. Dr. Cech lives in Arlington with her husband, her daughter, and their numerous four-legged housemates.